As war loomed over Germany in the early summer of 1866, Bavaria aligned itself with Austria against Prussia and armed for war. The Bavarian chief of staff, Ludwig Freiherr von der Tann, met with the Austrian leadership and suggested that the Bavarian army march into Bohemia. There they would form the left wing of the Austrian North Army, and along with the Saxons would hold off the Prussian First Army at Jicin while the Austrians dealt with the Prussian Second Army. Von der Tann’s bold plan might well have given the Allies victory, but the Austrian commander, Ludwig von Benedek, turned him down and Bavaria pursued a separate strategy. By the time Benedek changed his mind and called for the Bavarians to advance, it was already too late. 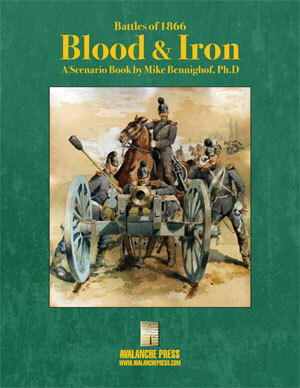 Battles of 1866: Blood & Iron is an expansion book for Battles of 1866: Frontier Battles. 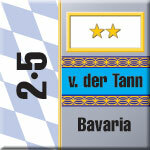 It adds the Royal Bavarian Army to the game, based on the Von der Tann plan. There are six scenarios included plus background on the Jicin campaign and the Bavarian proposal to participate. While this battle never took place, the scenarios are based on actual operational plans. 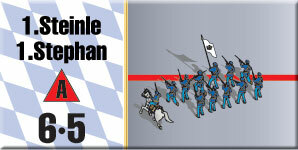 This module is not playable separately; it requires ownership of Battles of 1866: Frontier Battles. Click here to order this great product right now!